Nearly 400,000 people in the United States attempt to commit suicide every year, and about 30,000 actually do take their own lives. Depression is defined as a serious mental illness that is characterized by the persistent and overwhelming feelings of sadness, emptiness, and apathy. 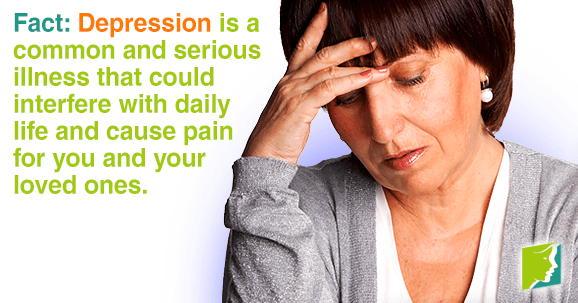 Severe depression can interfere with the ability to eat, sleep, and enjoy life. Depression triggers are a number of factors, like biological, environmental, and family history. Some people are at higher risk of developing depression than others. This article will debunk some of the common myths about depression. Fact: Everyone experiences sad moods sometimes, but those feelings typically go away after a while. On the other hand, depression is constant and overwhelming. It interferes with daily life and causes pain for both you and your loved ones. Depression is a common and serious illness, but not necessary all people experience it the same way everyone feels down now and again. Fact: Antidepressants are effective in treating depression, but they are not always the right treatment. Depending on the severity of the depression, things like exercising regularly and talk therapy can also be beneficial. Fact: Depression is a serious mental condition. Brain scans have shown that a person's brain with depression looks different than a brain of someone not suffering from depression. The parts of the brain that manage mood, thoughts, sleep, appetite, and behavior do not have the right balance of chemicals. Fact: Depression is a serious illness that should be treated as such; symptoms often worsen if left untreated. If you think you or a loved one is suffering from depression, it is crucial to seek professional help as soon as possible. Your healthcare provider will do a physical and psychological evaluation to determine if you are depressed, how severe it is, and which treatment is right for you. Treatments for depression include talk therapy, antidepressants, and making lifestyle changes. Fact: Although people with family history of depression are at higher risk of developing depression, they are not necessarily going to. It is important, however, to be proactive and keep an eye out for symptoms. These symptoms can include constant and intense feelings of sadness, guilt, and hopelessness, fatigue, insomnia, apathy, and changes in appetite and weight. Depression is a serious disorder and should be treated as soon as possible. Unlike sad moods, depression is a constant psychological state that can interfere with daily life. Symptoms of depression can include anything from fatigue and insomnia to suicidal thoughts and overwhelming feelings of helplessness. It is crucial to get treated as soon as possible because symptoms often worsen if left untreated. It is also important to be aware of the common myths about depression in order to properly educate yourself on the subject.